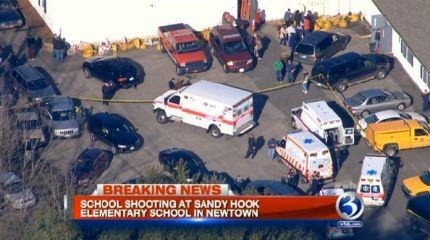 Home › Current Affairs › My thoughts on the Tragic Sandy Hook Elementary School Shooting. I just walked out to grab a coffee to come out to my office to write this blog and as I did I passed the bedroom of my 9 year old daughter sleeping. Her name is Laura. I stopped and watched her sleep:-trying to get my head around the incredibly sad situation in the US this morning where 20 children under the age of 10 have been gunned down and an additional 8 adults, teachers, have been killed at an Elementary School in Connecticut. There is a collective sense of grief as we all shake our heads in disbelief that this has happened again in the US. As it happened literally only hours ago, it’s still very early days in the timeline of this horrendous crime, but I thought I would blog a few thoughts I have about it. I can’t begin to imagine the horror for a parent to hear of a shooting in their child’s school and not know whether their child is alive or not. I trying and project myself into the situation and I think of the initial phone calls or twitter feeds that I would read telling me that there was a shooting at my daughter’s school. I imagine being panicked. Suddenly there is nothing more important in the world than getting to the school. I grab the car keys and rush to the school, driving for the longest 20 minutes of my life:- Praying desperately that Laura is safe. I would be fumbling through the radio stations trying to hear any news. I imagine the frustration of hitting the police road block and screaming at the police to let me through. I imagine running to the Assembly hall, my eyes scanning the scared contorted, tear stained faces of the children there, looking for a face I know. I couldn’t imagine what it would be like to be told, my daughter has been killed….. We so need to pray for all parents of children in the Sandy Hook Elementary School. We need as parents to hug our children more. Tell them more that we love them. Be cranky at them less. Let them be the children they are. When they drop and break a glass – it doesn’t matter. When they get grass stains on their good pants because they were playing on the grass with the neighbour’s kids, that’s ok too. When they go out and leave their bedroom a mess – it’s not the end of the world. Too many parents have regrets about how they parented. If you need to – change your parenting style. Go and buy some silly string today, have a water fight, be spontaneous:- make your children smile. For those parents who have lost children in this tragedy, we must pray for them. I simply cannot imagine how they would be feeling right now. For the Children who weren’t killed, but will be incredibly traumatized, we need to pray for them also. For the Emergency Services Personnel who were the first responders, what they have seen today, will stay with them for the rest of their lives. Pray for them. I know Americans are proud of the constitutional right they have to bear arms but surely the right to life trumps the right to have a gun. It was only several months ago that a man walked into a midnight screening of the Dark Knight and opened fire killing 12 people. In April 2007, 32 students were killed at Virginia Tech Campus. In July 1991, 23 people were killed in Luby’s Cafeteria shooting in Texas. In April 2009, in a New York Immigration Office, 13 people were killed. Maybe it’s time the US looked at gun control. I am trying to get my head around how messed up a 24 year old man must be to simply walk into a school and open fire on little boys and girls. Maybe it’s too early to say this, but I think at some point we need to look at the society that we have created that is producing mass murderers at 24 years old. So much sadness. So big a need for prayer. I agree with you Peter, it makes me wonder what happened to the bloke to make him shoot his parents (mum was a school teacher there & they found who they think is the father back at the shooters house) and then the kids?? What’s to say his parents weren’t some kind of peadophiles and he was ridding the world of them…and the children..what if they had been messed with..he didn’t want them to suffer like he’s had to. Just a thought really. Everything happens for a reason…most of the time we just don’t know and come to our own conclusions.I don’t condone what happened. I’m sure I’d be absolutely psycho if that happened to my children. It was just a thought that came to me….we don’t know the whole story. So before we go stringing people up (those that have that thought)…how about we find out everything. Once we can do that, then we can help to stop it ever happening again. Apologies if I offended in anyway. Love your heart Pete. Being married to an American and having lived there for over five years my heart aches for the families and the country. And like you, cannot imagine the grief of living through it and losing a child. Speaking as a father of three and granpa, ex cop, and christian I can, without hesitation or doubt tell you disarming innocent people never protected innocent people. Quoting stats re similar situations without the myriad of information post those incidents does not tell the whole story. I have always felt ten times safer living in the US than back home in Australia. Gun control has never worked anywhere. Follow the facts and you’ll find the opposite to be true. What has failed is the eternal vigilance needed to keep the garden weed free. We have allowed an enemy of evil and cunning to push out the fear of God and leave our populace without that protection. Ninety three million U.S. handgun owners did NOT kill anyone today. The answer is not in banning anything other than the political agenda that has been implemented stealthily over decades. Sadly the bulk of people have no interest in thinking about it …. a fact our enemy is aware of and takes full advantage of. Connecticut has some of the strictest gun laws in America. Instead of focusing on gun laws, how about the US Government focus on mental health care? Mental Health care is a major issue that is often swept under the carpet or the blame goes to the devil. Which really gives him glory? Clean living and teaching our children clean living would be a good start. Take a look at all the chemicals and sugar that is in everything these days. I’ve heard and seen that fresh foods (with chemicals) is too dear…then grow you’re own. It doesn’t really take a lot to change one’s lifestyle and possibly grow some ears to listen to those with mental health issues. Last night I stayed up with my 6 year old son until 3.30am as he was sick and needed his Mum. Today I got up and went to work in a classroom with children of similar ages. My thoughts today consisted of gratitude that I was tired as I had my son to hold and comfort. One conversation with another teacher about this situation had her in tears. Another discussion was about our ‘lock down’ procedure we do with children to prepare them for such a situation. She reminded that many of our classrooms have no blinds (as it’s not in budgets). In such situations it is very unsafe as our procedure requires us to close them so vision into rooms is limited while we hide in a storeroom with a class of children being silent. I pray we never need to use these procedures in real life, for the families of these beautiful innocent children and teachers and I thank GoD for my own family.